Elise_Grimwald (hace 2 años) #11448399I bought a pack of Ash, Misty, Jessie, and James many MANY years ago, and was wondering if my figures are authentic, the actual Chinese version, or just plain bootlegs? I can't immediately say bootleg because my Ash at least has the mouth of the original, but the paint on some is weird. Pictures will be uploaded in a minute. Those are the Chinese versions; I actually have those too before I got the US and Japanese releases. I think they were made before the later-looking bootlegs with the mouth drawn in. 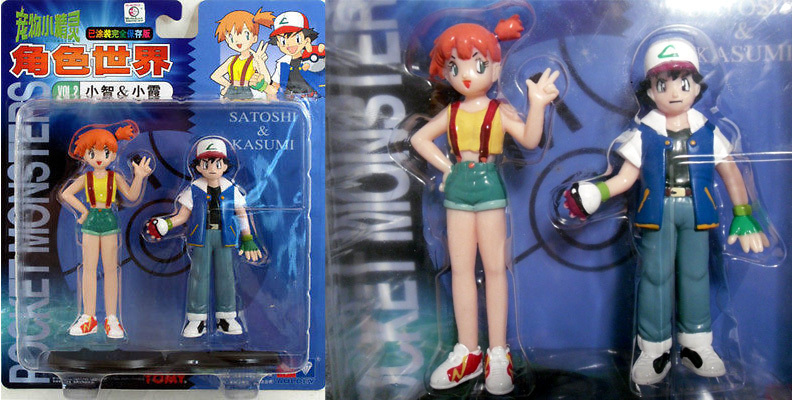 I bought a pack of Ash, Misty, Jessie, and James many MANY years ago, and was wondering if my figures are authentic, the actual Chinese version, or just plain bootlegs? I can't immediately say bootleg because my Ash at least has the mouth of the original, but the paint on some is weird. Pictures will be uploaded in a minute. Take (hace 3 años) #3205760Oh yeah, those. The Monster Collection line ENCYCLOPEDIA #28776 is actually a whole different line, so that's fine. Well, we're currently having some discussion there alert.php?mode=... regarding the Asian packaging, they may not actually be bootlegs, just Chinese versions. In that case there is no copyright violation. Hmm, interesting. If that's the case, then I'm not sure either. I just know that the paint quality between the two are a bit different from each other, which is another reason why I thought they were bootleg. You could see with Satoshi in the Chinese version that aside from the skintone being more pale, they drew a line for his mouth(quality can be decent to not so decent) i.imgur.com/c66... , while the Japanese and American release did not have it. I think there are some people who mistaken the bootleg packages as the real thing because it has some asian writing on it. So hopefully this will help those who want to see what the authentic one looks like. Oh yeah, those. The Monster Collection line ENCYCLOPEDIA #28776 is actually a whole different line, so that's fine. Indeed, now that you mention it, those boxes are indeed mainly written in chinese, especially on the back. It's sad, but I alerted in order to provide some example for the "counterfeit" section. Animexcel (hace 3 años) #3203684Nice! I think everything looks good right now. These were the only human characters/trainer figures released for this line. The boxes that are missing the card are indeed bootlegs. You could also tell by the different language text on the upper left corner. One is Japanese and the other is Chinese. Take (hace 3 años) #3202829Thanks a bunch :) I also used your pictures for the other figures in the line, created a classification to make them easier to trace ENCYCLOPEDIA #87749 and finally added Joy, since apparently she was missing. I re-link every pictures accordingly, hopefully I didn't mess up anything or forgot one. Since you seem quite knowledgable about this line, do you know if boxes missing the "card" thing (like this one picture/704586&... for instance) automatically make them bootlegs? Nice! I think everything looks good right now. These were the only human characters/trainer figures released for this line. That's great news. Even though these are bundled in Japan, people still got these same figures when they were released separately in the US. Thanks for creating entires for them. Thanks a bunch :) I also used your pictures for the other figures in the line, created a classification to make them easier to trace ENCYCLOPEDIA #87749 and finally added Joy, since apparently she was missing. I re-link every pictures accordingly, hopefully I didn't mess up anything or forgot one. Since you seem quite knowledgable about this line, do you know if boxes missing the "card" thing (like this one picture/704586&... for instance) automatically make them bootlegs? Animexcel (hace 4 años) #2796722The picture currently used for this is a bootleg set. I have the Japanese import.